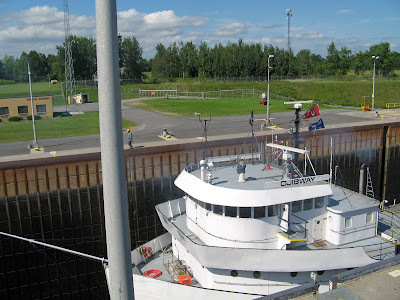 Eisenhower Lock at fifty, and more about classic lake boats. 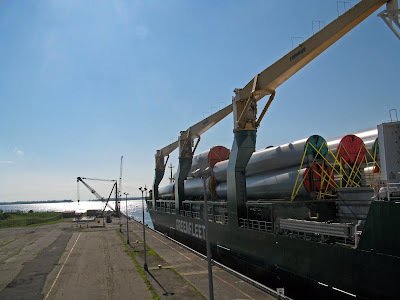 Over the past couple of months, I've received a lot of hits on my blog off web searches for "Eisenhower Lock", about which I've posted before here and here. I asked my mother-in-law, who lives in Massena, New York, a mile or so from the Lock, why this might be. She said the Lock has its fiftieth anniversary this year. 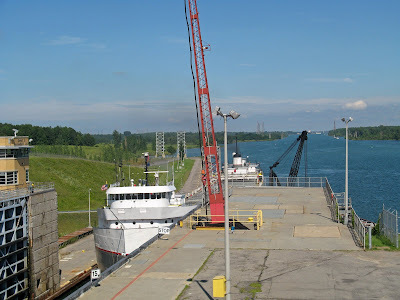 When we visited Massena a couple of weeks ago, I made my usual trip to the Lock. I arrived as the classic laker Maritime Trader was locking through. 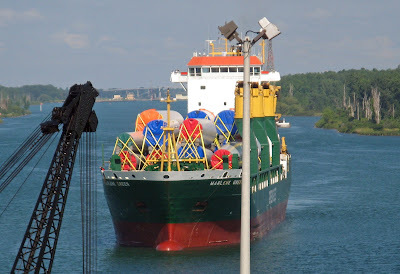 Here she is, leaving the Lock and headed upriver in ballast toward Lake Ontario and her home port of Hamilton. By "classic laker" I mean a ship built specifically for Great Lakes/St. Lawrence River trade, with the traditional design (dating back to 1869--see under "Old Style Lake Boat" in Herb's Lake Boats here) having the superstructure containing the bridge and crew quarters at the bow, and the engine room, another deckhouse and the funnel at the stern. About an hour after Maritime Trader departed, another classic laker of Canadian registry, Ojibway, entered the Lock. Back in January, I posted about the thinning of the ranks of classic lakers, but those that survive are, I reckon, more likely to be found trading between St. Lawrence River ports and the Lakes, because they are small enough to fit the St. Lawrence Seaway locks. Here's a closer view of Ojibway's forward deckhouse and bridge. Note the bowsprit often found on classic lakers. Canadienne bakin' on Ojibway's fantail. Ojibway leaving the lock, bound upriver toward the Lakes. According to the chalkboard at the Lock's Visitor Center, she was carrying a cargo of coke (presumably the kind burned in steel mill furnaces) to some destination in Ohio. Closely behind Ojibway came the "salty" (i.e. 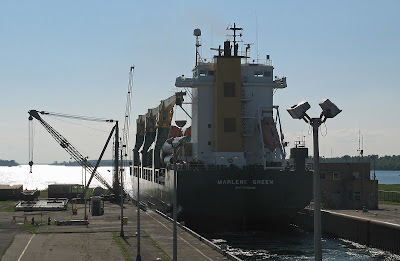 oceangoing) freighter Marlene Green. The chalkboard listed her cargo as "windmill", which I thought seemed appropriate for a ship of Dutch registry. Here's a close view of Marlene's wheelhouse and bridge as she sits low in the Lock. 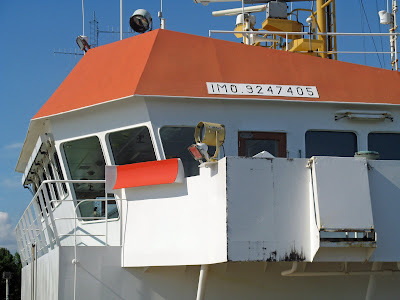 I don't know the significance of the alphanumeric sequence displayed on the coaming above the wheelhouse. Perhaps some reader can enlighten me. 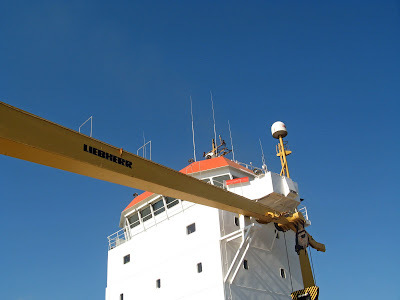 Here's another view of Marlene's superstructure, and one of her deck cranes, after she had been lifted to departure level. The metal tubes and truncated cones stowed on Marlene's deck are sections of a tower that will hold up a giant wind-driven electrical generating turbine. The turbine blades are probably stowed in the hold below. 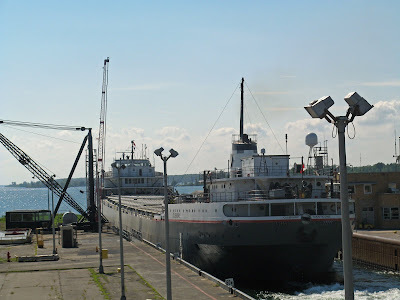 Here is Marlene heading out of the Lock and upriver toward her destination in Michigan. Later on the same day, Tugster photographed her on her way past the Thousand Islands. 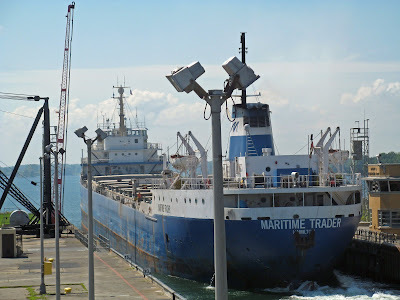 As a service to readers who may be visiting Eisenhower Lock or other Seaway vantage points, I'm putting here (as I did on an earlier post) a link to the Seaway web site, which has a further link to a map showing the positions of vessels navigating the Seaway. Your correspondent attempts metrical poetry. In writing this, I violated several of Baer's instructions. For example: (1) the tone of the poem is humorous, not heroic; (2) I used two historical figures, not one; and (3) I used a slant rhyme ("kin/him"). I also played hob with history a bit: Wilberforce didn't squarely deny simian ancestry; he just asked Huxley on which side of his family tree his monkey forebears could be found. Nevertheless, I hope you enjoy it. Try singing it to the tune of "Amazing Grace". 8/13 Update: On the subject of evolution, there's a great column by Olivia Judson on the op-ed page of today's New York Times. My eye was caught by this strung-together word on a bus-side ad for a TV show called Baisden After Dark. It struck me that the first word in this compound has, in our popular culture, become antithetical to the other two; that is, being intellectual implies being both uncool and un-funky. As to the connection between the other two, I'm sure it's possible to be funky without being cool, but not sure if one can be cool without being funky. Whether it's possible to be intellectual and cool but not funky might be called the "Barack Obama question". If one could translate this compound word into French, it would probably not raise any eyebrows. (Do the French make compound words? It seems altogether too German.) There is a long tradition of Gallic intellectualfunkycoolness, going back at least to Rabelais. Even here, it was possible to be intellectual, funky and cool in the 1950s and 60s (think of the Beats). Who manages the trick today? Perhaps Mr. Baisden, if he lives up to his ad copy. One candidate I'll nominate is Joe Maddon.